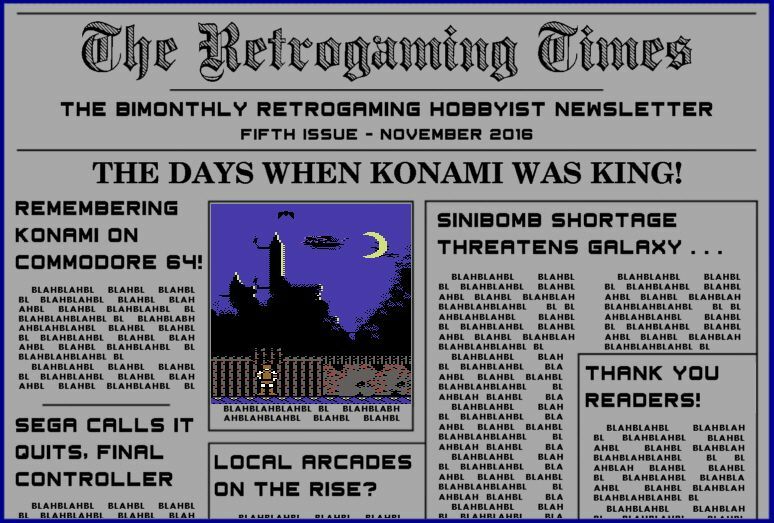 I just learned of this online retro gaming newsletter and wanted to share it here: The Retrogaming Times! The Retrogaming Times is the furtherance of Retrogaming Times and Retrogaming Times Monthly, two of the longest running retrogaming newsletters of all time. This newsletter is entirely hobbyist driven and content created by retro fans. It even welcomes contributions from readers. Be sure to check out the site for their latest issue and for the back issues. The first issue was released in March 2016. It is! I used to read Retrogaming Times Monthly but it just stopped happening. It's cool to see that it has a legacy that continues. I printed all of these as PDF files (from the web page) to read on my tablet. They even use us as a source from time to time so please promote them as much as possible. THE AMBITION OF LIMITLESS EXPLORATION! + NES Classic Edition - Worth Waiting For? These newsletters have some really cool stuff in them. They do indeed! Always nice to read. I must have missed this so far! Love the basic layout. The US perspective on classic gaming is always intriguing as it was so different to the UK. I read the P-51 Mustang article. What a heartwarming story. Cool, glad you've enjoyed it. The latest issue is out, celebrating the anniversary of the "Times." As an added bonus, there is an article on this issue that I wrote. Be sure to check it out. TWENTY YEARS OF RETROGAMING TIMES! + The "What If Universe" - E.T. You, sir, are one fast reader!